Take the chicken and make *deep* cuts in it (so that the masalas seep in quickly). If you are using soy sauce as the base, put some on the chicken pieces and let it seep in the cuts. Rub in the masalas as a mixture or one at a time. The idea is to let the masalas seep in the cuts with the soy sauce. If you are using yogurt you'll get a more authentic taste since the original TC is after all marinated in it. 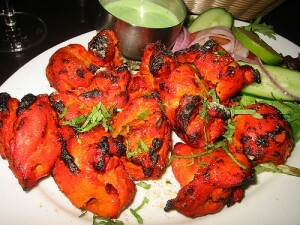 In this case, mix the masalas in the yogurt first and then rub the stuff into the chicken cuts as before. The yogurt tends to leave considerable amount of water behind. DON'T THROW THIS AWAY. Let it evaporate in the oven with the chicken. This will keep the pieces from getting dry if overcooked. Cook the chicken till it starts turning brown, and the cuts you made start "expanding".